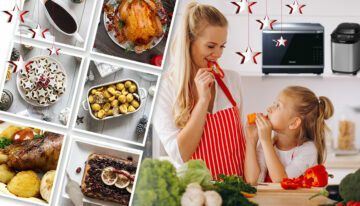 Serve seasonal treats and a deluxe Christmas Day feast from our easy microwave and bread maker menu. When you have friends around for a TV binge-watching party, share plates are the best way to stuff your guests full of delicious food without a whole lot of hassle. Simply set these great dishes up in front of the big-screen and you’ll have a room full of very happy people. Wouldn’t you like an easier way to get weeknight dinners on the table? You’ll love this healthy and delicious collection of recipes made using Panasonic small kitchen appliances. Spoil dad this Father’s Day with a whole day of feasting at home with easy recipes tailored to take advantage of time-saving appliances like bread makers, juicers and microwave ovens. Huge feast with very little fuss.